Editor’s note: Charles A. Czeisler, Ph.D., M.D., is Baldino Professor of Sleep Medicine and director of the Divisions of Sleep Medicine at Harvard Medical School and Brigham and Women’s Hospital. He also chairs the National Institutes of Health Sleep Disorders Research Advisory Board for the National Center on Sleep Disorders Research in the National Heart, Lung and Blood Institute. 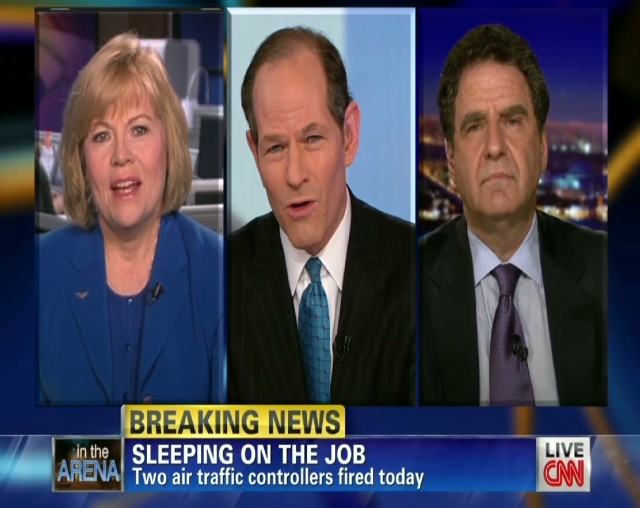 (CNN) — It’s no surprise that a half-dozen air traffic control specialists were recently caught sleeping on the job. The Federal Aviation Administration is well aware that air traffic controllers have been falling asleep every week at each and every air traffic control facility in the nation for at least 30 years — and they still are. The issue came up in congressional hearings in 1983, where I testified about methods to improve the design of shift work schedules that disrupt sleep. Afterward, I witnessed then-Rep. Al Gore grill FAA officials about the fatigue induced by the notorious “rattler” schedule, which requires controllers to work two shifts within 24 hours twice in a four-day workweek. That includes an early morning day shift (6 a.m. to 2 p.m.) followed by an overnight shift (10 p.m. to 6 a.m.) the same day, with time for only a couple of hours of sleep between shifts. That same year, the National Transportation Safety Board also urged the FAA to address air traffic controller fatigue, but the advice fell on deaf ears. No wonder 95% of air traffic controllers regularly feel tired or sleepy at work, 77% catch themselves about to doze off while at work, 53% admit to “taking naps at work,” and 46% reveal they “often fall asleep unintentionally,” according to FAA reports. Controllers’ top complaint: fatigue from quick turnarounds. When awake, controllers’ performance is often as impaired as if they were intoxicated. Sleep deficiency slows reaction times, impairs memory recall, makes it harder to focus attention and increases distractibility. Seventy-nine percent are so exhausted they experience lapses of attention while driving and 36% fall asleep at the wheel while commuting home from the midnight shift. What a way to start a three-day break. Scientists at the FAA’s Civil Aerospace Medical Institute concluded in 1975 that “individuals making a 12-hour alteration in the wake-sleep cycle should not perform critical tasks during the first awake period following the change,” yet the FAA requires just that. Let air traffic controllers take naps? The NTSB in 1989 cited the FAA’s response to air traffic controller fatigue as “unacceptable.” In 2001, an FAA-appointed advisory committee again recommended schedule reform and a fatigue-management program. This was never acted upon. In 2007, the NTSB, citing a series of fatigue-related air traffic control incidents, implored the FAA to reform its scheduling practices and implement a fatigue-management program, but the FAA took no action. Fortunately, Transportation Secretary Ray LaHood has pledged reform. FAA Director Randolph Babbitt, admitting an extra hour between shifts is inadequate, promised tougher actions to combat fatigue. The department should seize this opportunity to implement NTSB-mandated comprehensive fatigue-management policies in all modes of transportation. Fatigue is inherent in 24-7 operations. Ordering people not to doze will not work. From 30% to 50% of all night shift workers fall asleep at work every week, even in high-stakes operations like nuclear power plants. The only NASA study that recorded pilots’ brain waves during transoceanic flights caught 44% of the pilots sleeping in the cockpit, just like their passengers in the back of the plane. We must confront the reality that night work induces fatigue, rather than seeming surprised that rattlers bite. Instead of expressing shock and demonizing night workers for being human, day-working managers should recognize them as unsung heroes. After all, night workers sacrifice their own health to keep our 24-7 society running safely, facing increased risks of cancer, hypertension, heart disease, hormonal disruption, obesity, diabetes, depression and occupational injury due to sleep deficiency and chronic occupational jet lag. Transportation workers and management need to learn to minimize fatigue, starting with adoption of safer work schedules that provide enough time for sleep each day. The European Working Time Directive requires that workers in all occupations have at least 11 hours off duty each day, and limits shifts to 13 hours. Shifts should rotate clockwise, from day to evening to night shift. Responding to the 2007 NTSB mandate, the FAA drafted similar policies in 2008, but never implemented them. Moonlighting on other jobs and travel time from distant cities should be included in work-hour limits. Such sensible work-hour policies, though necessary, are only the first step. Without treatment, sleep disorders — like sleep apnea, which affects about 25% of transportation workers — worsen accident risk. Sleep apnea screening and treatment compliance policies, using objective measures, are necessary for all workers in all modes of transportation, from operators to maintenance staff. Yet such safety initiatives, recommended by a medical expert panel three years ago for commercial drivers and by the NTSB before that, have languished at the Department of Transportation. Education is essential. Workers have a responsibility to make sleep a priority while living in a 24/7 society so rife with sleep deficiency that nearly 2 million Americans fall asleep at the wheel every week. Technologies that continuously monitor alertness and compliance with regulations are sorely needed — like in-vehicle drowsiness detectors and electronic hours-of-service recorders. The efficacy of countermeasures should be field tested using objective brain wave recordings that track how often controllers fall asleep in the towers, as Gore suggested in 1983. Employees must be encouraged to admit, without facing repercussions, whenever they are too tired to work safely. No one should ever be scheduled to work alone at night in a critical job like air traffic control. Finally, it is ironic that air traffic controllers are allowed to smoke and eat during scheduled breaks, but are forbidden to sleep on break, which would enhance subsequent performance. However, workplace napping should not be used as a ploy to perpetuate the rattler schedule, which the FAA should ban in aviation. The opinions expressed in this commentary are solely those of Charles A. Czeisler. Hi Chuck. Nice site. Nice blog. Good book. All very good-looking, including that guy on the cover. Thanks for publicizing the Czeisler piece. He has been one of the country’s leading sleep researchers for more than two decades. I published a piece in the late ’80’s on the 2-2-1 schedule reviewing the research up to that point in the Journal of Air Traffic Control but no official response was ever offered by the FAA. Czeisler was the go-to guy for sleep research even back then. CAMI has done a number of sleep studies all pointing toward the terrible impact of 2-2-1 but these studies had no impact on policy. Other countries acknowledge the sleep problem in ATC. Eurocontrol has sponsored a number of sleep studies all saying the same thing as Czeisler. Perhaps the kind of public discussion we are seeing now on the impact of 24/7 operations on controller alertness will result in some positive policy decisions by the FAA. Best to you, Chuck, and I wish you well on your next in the series.